After the feverish excitement of the past few days, it’s a great relief to have a few days off from the soccer. Cape Town cooperates with some beautiful winter weather. We spend the time doing some touristy stuff. 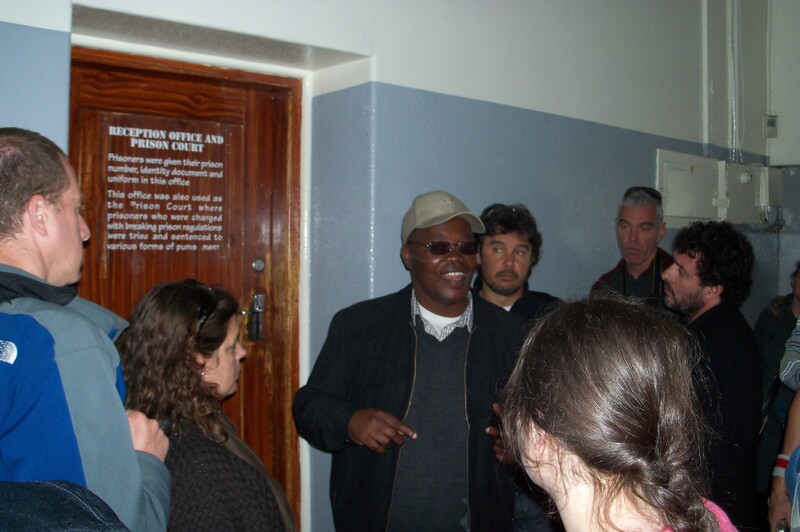 Sunday we go to the local market in Green Point, just minutes from the stadium. It’s very quiet and peaceful, a world (cup ?) removed from all the drama of the day before. We stock up on vuvuzelas and other souvenirs to bring home for friends. In the afternoon we head to Suikerbossie, a famous tea room/restaurant near Hout Bay to indulge in one of South Africa’s greatest treats – scones with jam and cream (you have to try it). 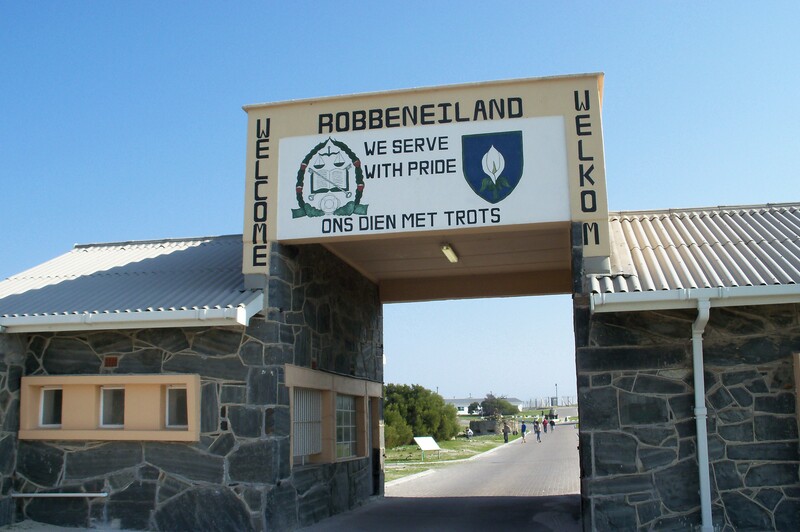 On Monday we’re off to Robben Island. It’s a big group of us, myself, Liora, our 2 boys, my brother Gideon and his 2 older children. A chance to get some history and education in between the soccer. It’s a good trip, nobody gets sick on the ferry, and the kids get an important lesson into South Africa’s very dark past. Although it probably does not resonate with them quite as much as the grownups, especially my brother and me having grown up in Cape Town. 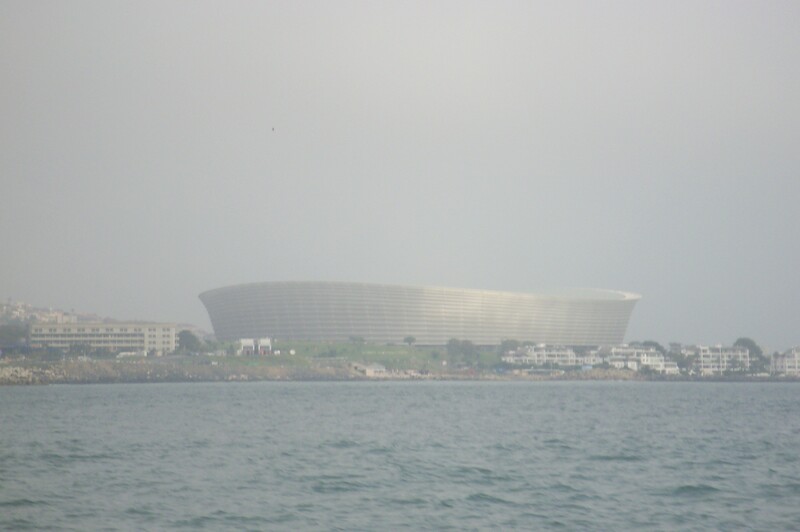 Tuesday is Cape Town’s last big World Cup day. The city teems with excitement but also, already some sadness that the party will soon be over. 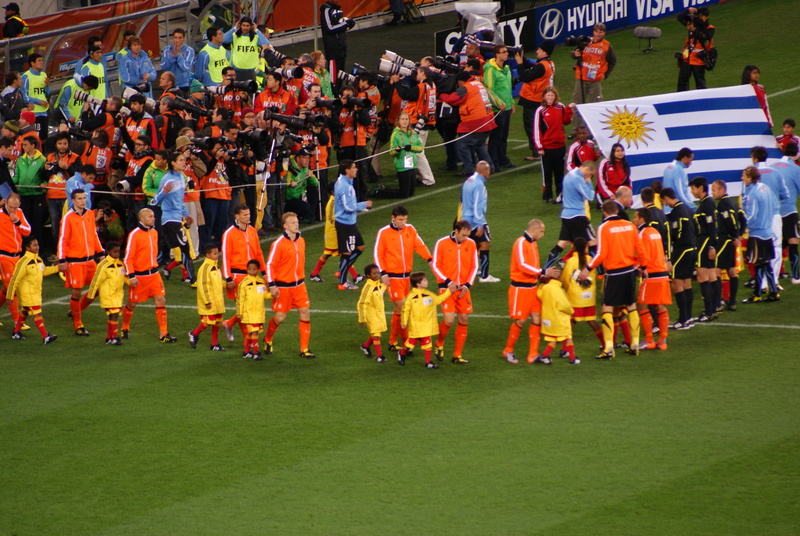 It’s World Cup semi final night, Holland versus Uruguay. We spend the morning in Greenmarket Square trying some last minute World Cup shopping and tasting the atmosphere. 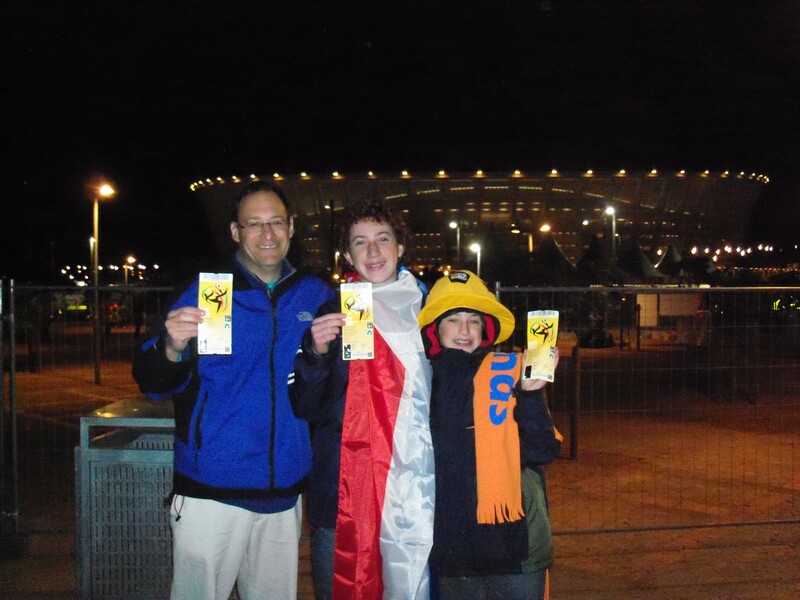 There are some Uruguayans around, but the city has already turned orange in anticipation for tonight. I remember clearly that night about six weeks earlier, when FIFA had put more semi final tickets on sale on their website and I sat up late into the night trying to secure some. And when the option to buy came up on the screen my heart was pounding so hard I was almost frozen. And having bought them I waited till 3am for the confirmation email to arrive but eventually had to go to sleep. But best of all, hearing Liora in the morning telling Benjy we had tickets. Nothing like the thrill on a 12 year old’s face to tell you you’ve done something really big as a dad. We’re back in town by 5.30pm. The scenes are incredible. As far as one can see, there’s orange everywhere. 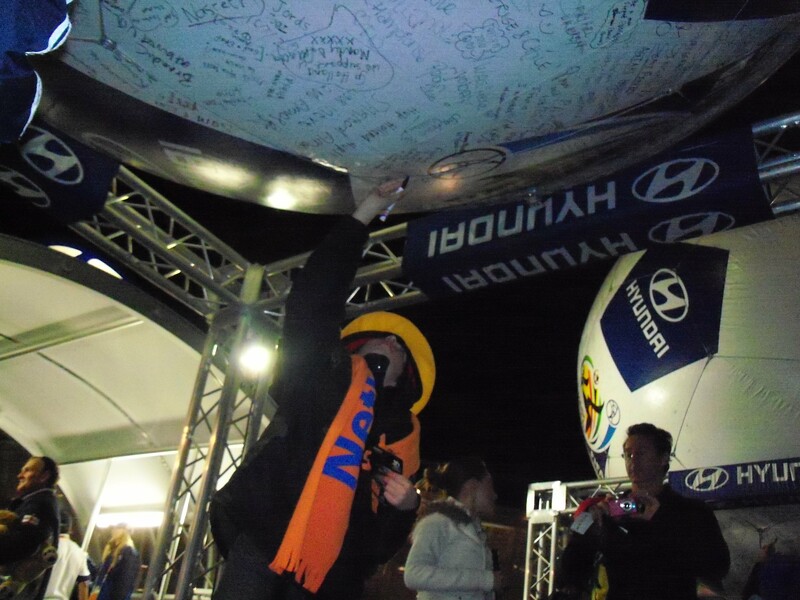 We join the fanwalk which is tonight, Made in Holland. It is as if Holland are playing at home in Rotterdam or Amsterdam, and the other country hasn’t found that out yet. It’s an amazing walk, and we try make it as long as possible. 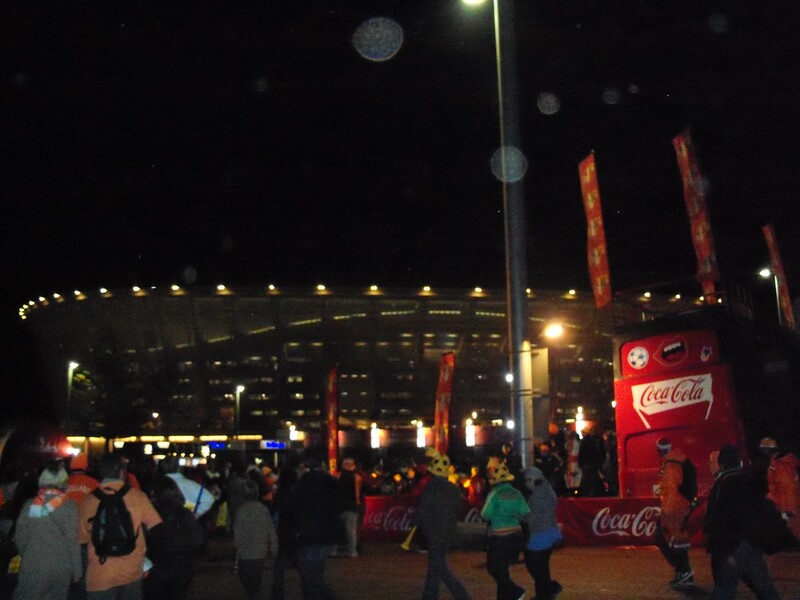 Eventually we get into the stadium and await the teams. It’s a super dramatic match. We’re expecting (or rather hoping) Holland will win easily but they start slowly only to go ahead through an incredible solo goal by Van Bronkhorst right in front of us. But just before half time, Diego Forlan, possibly the star of the tournament scores a great goal himself and the second half is tense. Holland get two goals fairly late and it’s all over but in the last few minutes Uruguay score and press for the equalizer. When the final whistle blows it’s Holland in their third final and the stadium breathes a collective sigh of relief. 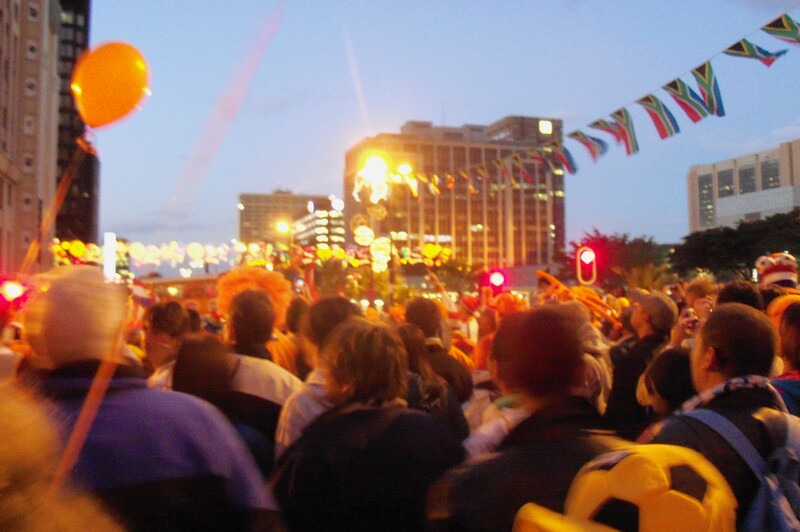 We walk back into town amidst the Orange Army celebrating and claiming Cape Town to be theirs. Another wonderful day.